Good Friday morning to you! I'd say I'm having a good run of getting my blog back on track. I'm lying awake at night thinking of posts, I'm having new ideas all the time and I have more that I want to write about than I have time for! So that's good, right? I'm happy to see some life springing back here and I hope I can keep it up! 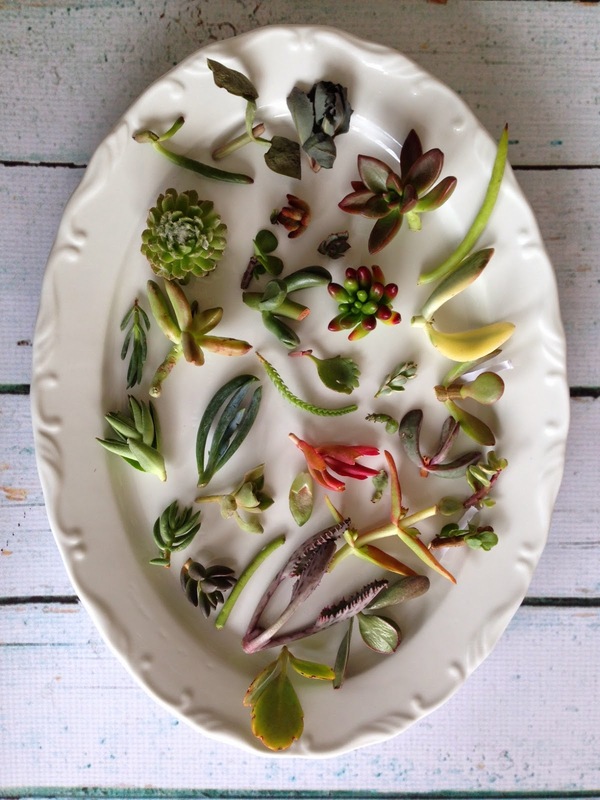 Today, I'm going to share about one of my favorite collections: succulents! While super trendy right now, they have long been a favorite of mine. In my house lives two succulents that I've had for almost ten years! 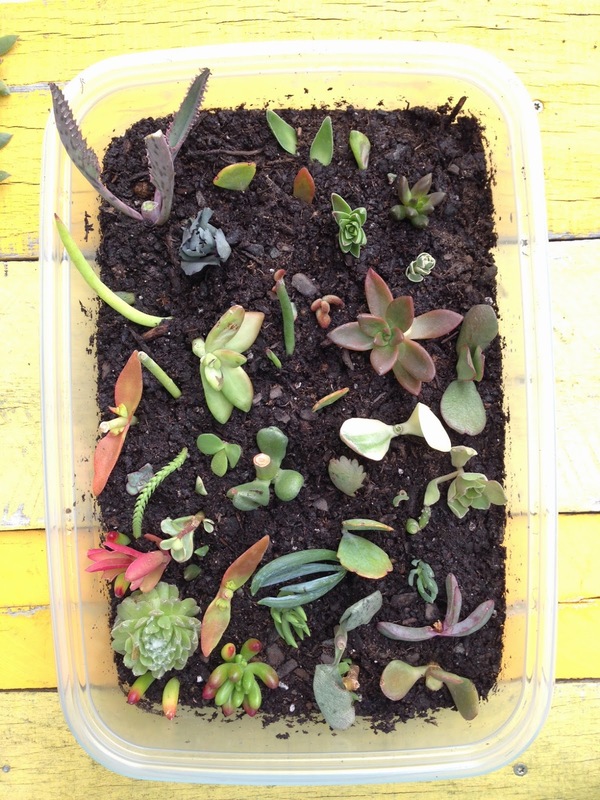 Succulents are easy to care for, easy to grow and easy to SHARE! 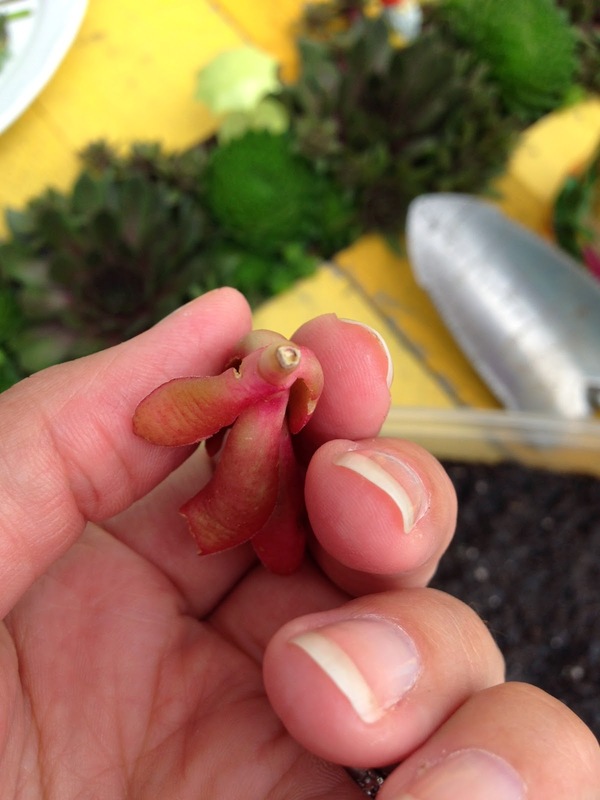 If you are unsure of what propagation is, you've come to the right place! Propagation is simply creating a new plant from an old, established one. 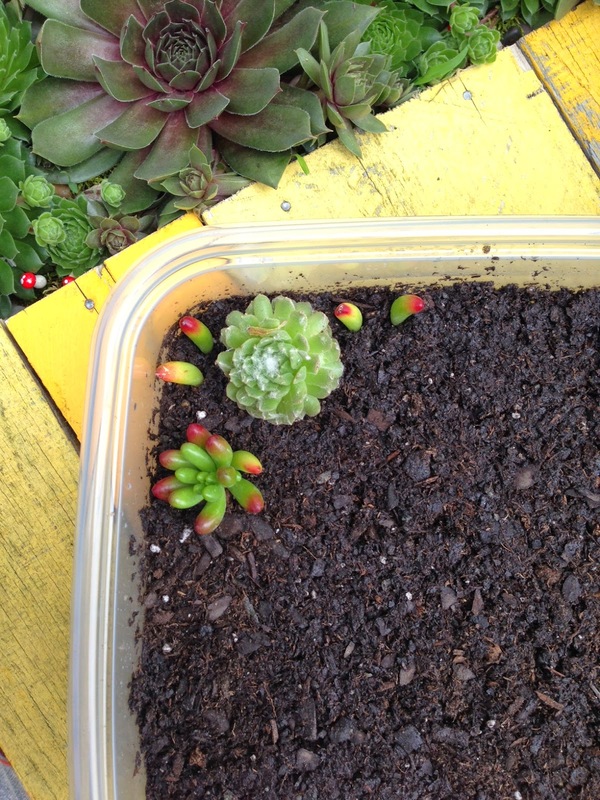 And when it comes to succulents, they practically do this themselves!! 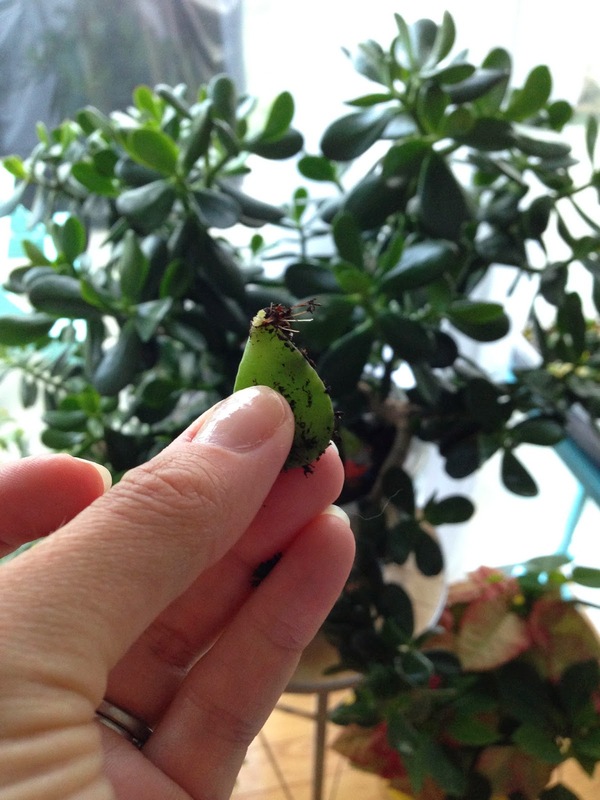 More than once, a leaf has fallen off of my enormous Jade plant, landed in it's own pot and a couple weeks later that leaf has roots and new baby leaves! In fact, I just got up and walked across the room to see if I had any to show you and look! I just picked this leaf up out of that Jade's pot and it's a baby! That little leaf will become a Jade plant all on it's own and I didn't have to do a thing! See the tiny roots? And that little tuft of bright green at the top are new tiny leaves! Fun right?! So have confidence, if the plant can do this itself and it doesn't have coffee or anything, surely we can too, right? See that Jade in the back ground? HUGE! It's about 2ft by 3ft, been moved from house to house and still loving life! And if Jade isn't your thing, no worries. 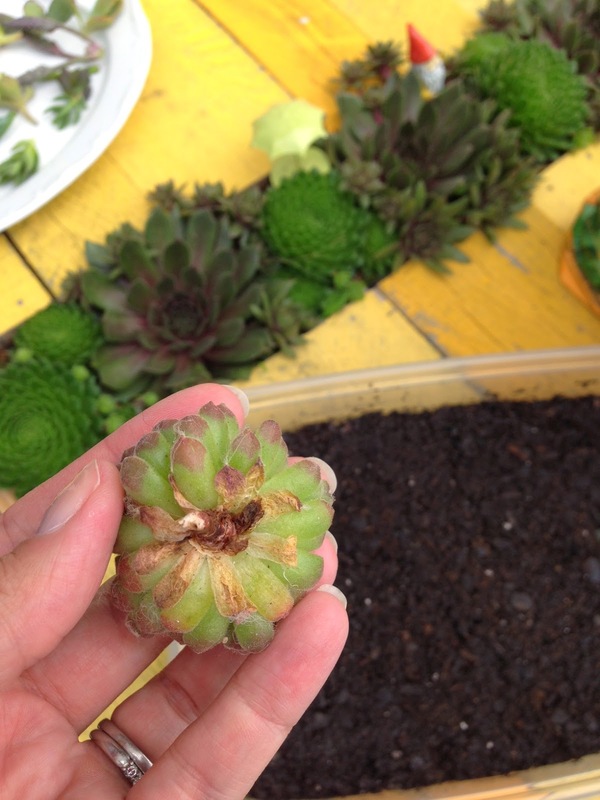 There are approximately one million kinds of succulents! You can find them at almost any store like Lowe's or Home Depot or any store that has a plant section. My favorite for finding the rare ones is buying them online! I love modern technology! The selection of succulents you see above was bought from a store on Amazon called Sara's Succulents. Buying cuttings (as seen above) is a great inexpensive way to get several varieties at once. You just have to have a little patience but it's fun to watch the babies above become plants! If you already have succulents...or your mom does...or your grandma does you can also get cuttings from them! Just grab a leaf while they are in the bathroom or have your kids create a distraction and throw a couple of leaves in your purse. (That's a joke, you should ask nicely and I am sure they won't mind). 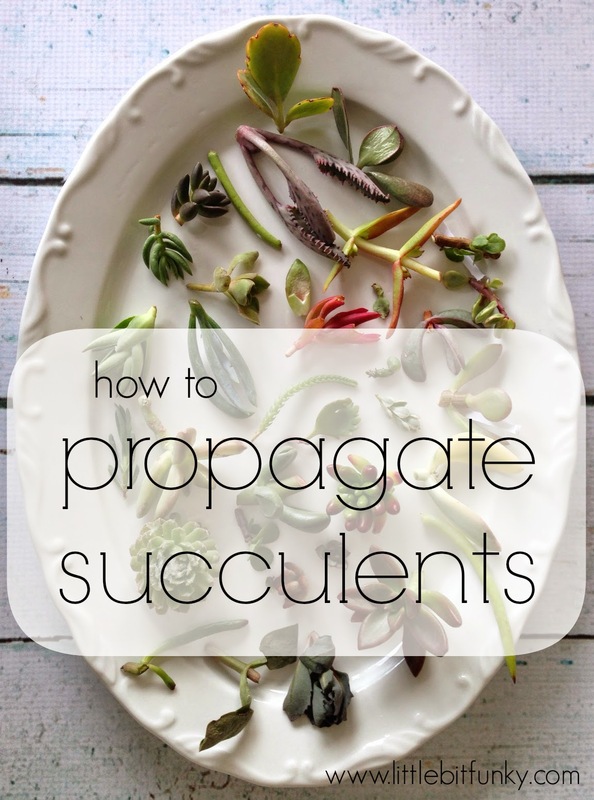 Once you have your succulent bits and bobs you are ready to propagate! You'll need some soil. I like this one (found at any store that sells dirt). 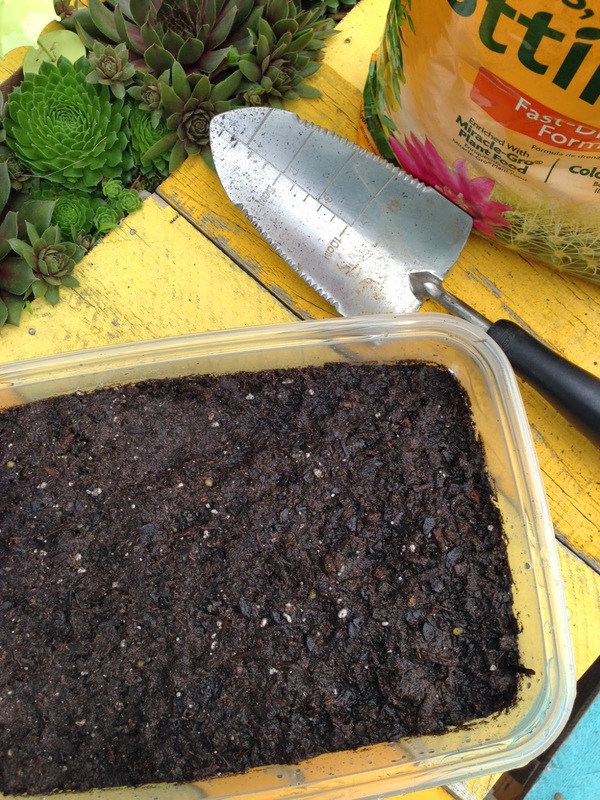 Or you could make your own using equal parts sand, vermiculite, and perlite. Now you are essentially making a little plant nursery. This is not where they will live forever, just until they grow up and move out on their own. So it's ok that they share a space while they get used to the big, wild world! Here I am simply using one of those plastic reusable food storage things. I put some pebbles in the bottom to help with draining. 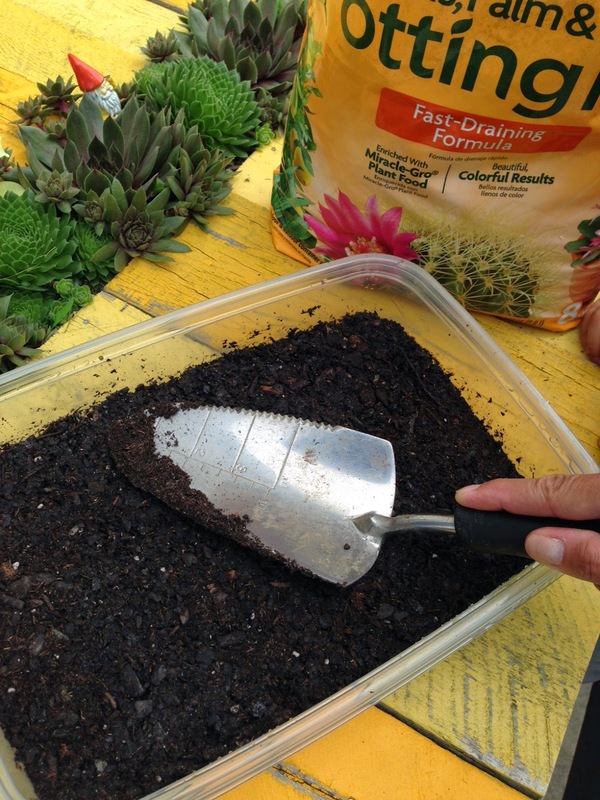 I added ample dirt and watered it, then mixed up the dirt pretty well. Then I tamped it down (and tamped is a word?! who knew?). Now, you want to make sure your succulents bits have dried up on the ends. This is important to help prevent rot. See how the plant above looks calloused over? That's good! If you order your cuttings online, by the time they get to you, they will be ready to plant. If you "borrow" them from your mom, let them just sit in a window sill for a couple of days until they are good and dry on the ends. If you are planting something like this, which has a center stem, you will want to clean it up a bit. Remove the dead leaves and a couple of the live ones if necessary to make sure you have a good sized stem to push into the dirt. Like this. If the leaves you remove look alive, don't throw them out. Stick them in the dirt too! There's a good chance you can get a plant out of each leaf! Then, just stick 'em in the dirt. See the leaves I've shoved in the dirt also? The boys actually enjoyed doing this. Once all of your cuttings are in the dirt, place them in a sunny window and keep tabs on watering (not too much). Eventually you will begin to see life, new leaves and such will begin to appear. Once you have established plants you can move them into their own apartment! 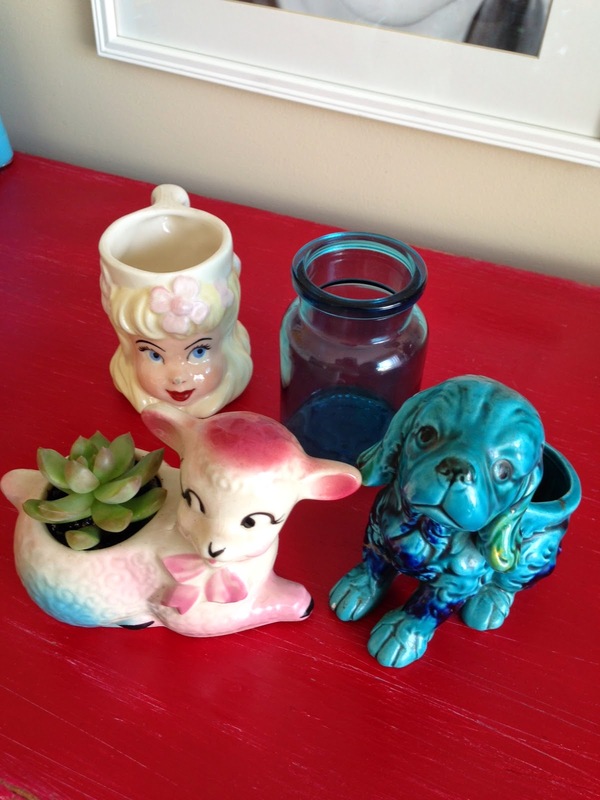 I've started to keep an eye out at yardsales and thrift stores for fun containers that would make good plant homes. 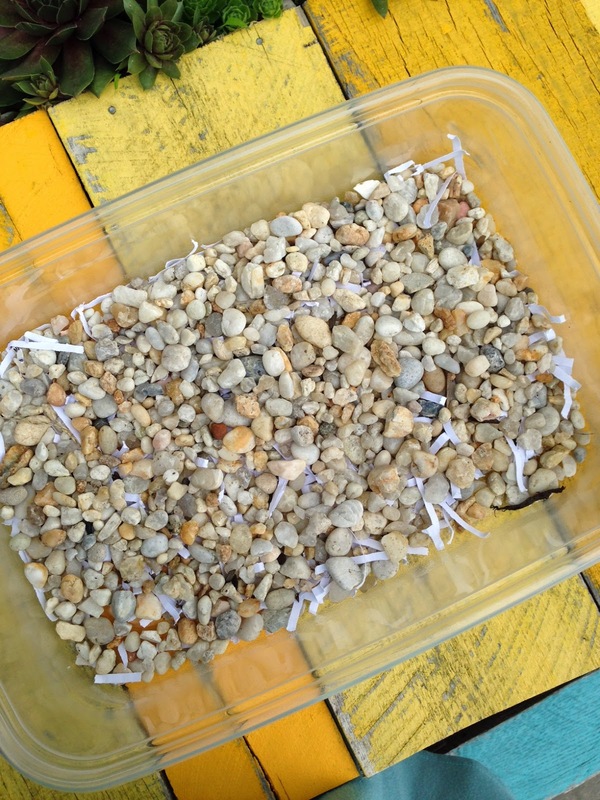 Just be sure you add a layer of pebbles on the bottom to allow for proper drainage. Then sit it somewhere until the end dries out...and proceed with the above steps! 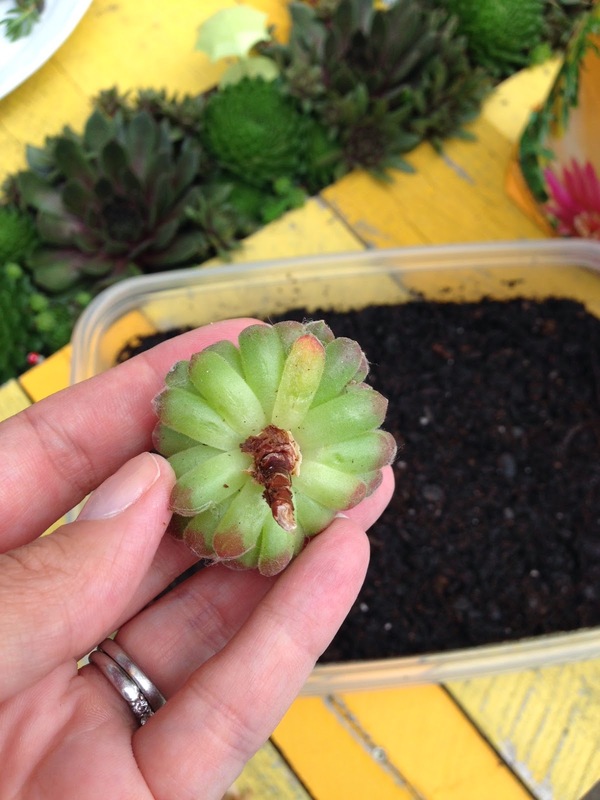 Propagation is a great way to create gifts for friends or swap succulents with others! It is very easy to do and has a very high success rate! I hope you've learned a little something and have fun making your own plant babies! I wondered how to find those neat varieties because I've never seen them at the stores where I live. Amazon?? Of course! Thanks for sharing that tidbit! I have one succulent and here we go!!! how do you plant it after new growth has sprouted. put the whole leaf with the new growth in the dirt or plant only the new growth and throw away the leaf? How did you get your jade to grow that large?! Mine is about an inch tall and it's been that way for a few years now. I have been growing and killing plants for about a year. In Florida it turned cooler in early December. My plants have been moved outside into a sheltered deck. They are growing at such a fast rate, I cannot believe it. Indoors watering was a touchy problem. Outside the soil is watered every afternoon with a garden hose and they are loving it. I take periodic photos and what I have learned is that autumn in Florida is growing season and deeper potted containers work better than small shallow potting. 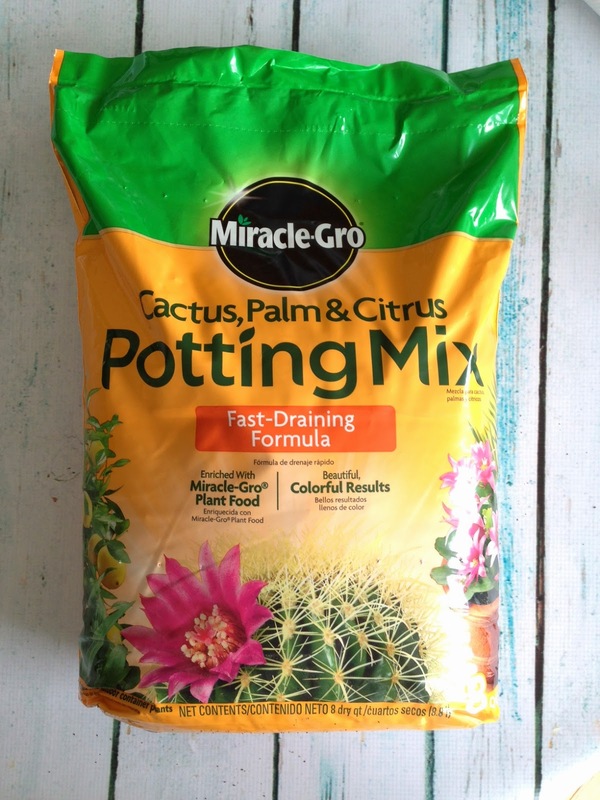 I have better luck wth making my own potting soil by using three parts ordinary potting soil with two parts sand, and one part perlite. Didn't have good luck with cactus soil. I wish I could post photos of all my leaf babies growing like crazy.